Observed near the Mtembur River, West Pokot, Kenya, July 2014. Host plant is Senna occidentalis. From Wikipedia: Erysiphales are obligate parasites on leaves and fruits of higher plants, causing diseases called powdery mildews. The infection of the host plant begins with the sexual ascospores, or the asexual conidia germinating on the surface of the plants leaf or stem, resulting in septate mycelium of uninucleate cells. 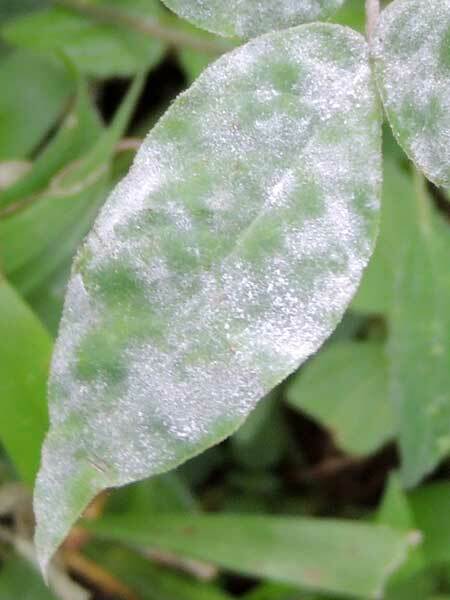 In most powdery mildews only the epidermal cells are attacked. The external mycelium gives rise to short, erect conidiophores, each of which bearing a single row of barrel-shaped spores, the youngest being at the base (the affected parts become thus covered with a forest of conidiophores assuming a white powdery appearance). The ripe spores become detached and are readily dispersed by the wind, causing fresh infection. In autumn the sexual cleistothecia ar produced. The cleistothecia represent the resting (hibernating) stage of the pathogen. The ascospores remain dormant all winter to germinate in spring [Dry season dormancy? -mjp]. When the asci expand they rupture the chasmothecia wall, throwing the ascospores into the air. 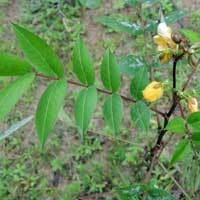 The host plant in this case was a shrubby weed of pastures (follow thumb link for more about the plant) and as a result of heavy animal grazing pressure this plant was growing in dense stands. That happens because the animals don't eat it due to toxicity or unpleasant taste. Now, dense stands of the same plant are vulnerable to attack by insects or in this case fungal pathogens.